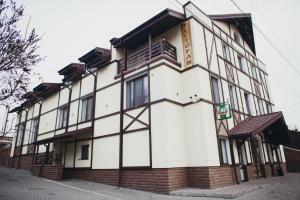 This Zolochiv hotel is located only 600 metres from Zolochiv Bus Station. It features free Wi-Fi, a terrace and bicycle rental facilities. Complex Zolota Pidkova offers simply decorated rooms and suites. Each one includes a flat-screen TV, wardrobe, and private bathroom with complimentary toiletries and a hairdryer. Guests can enjoy drinks at the hotel’s bar. Hiking and cycling are possible in the surrounding area, and Zolochiv City Park with its lake is only 300 metres away. Zolochiv Castle is 50 metres away. Zolochiv Train Station is 1 km from Complex Zolota Pidkova and Lviv Airport is 70 km away. Free private parking is available on site at the hotel.